Hey. So that document is pretty general but the idea is still there. It’s the Scions.zip document in the Scions topic. While I’m here though I wanted to share a couple images that could serve as inspiration. 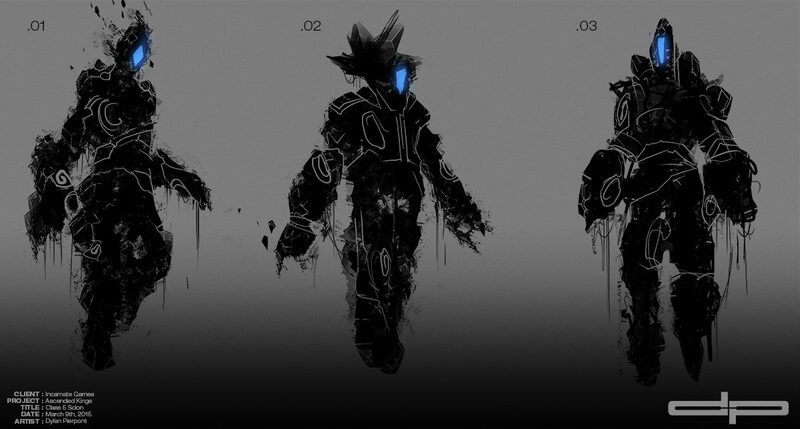 Essentially the design you come up with for the Class 5 will be significantly evolved from the class 3. Standing upright, very commanding, steadfast, singular in focus, ancient looking. One thing I didn’t mention (to my surprise) was the ylem gemstone that appears in the Sentinels face at this point. You can shape it how you best see fit: symmetrical, assymetrical, however, let’s just be sure that it is very angular, cut and complete, very “finished” looking; this gem in its face is now in its most refined stage. I have this idea that it will take up the major central area of its face. I’d also like (eventually) to incorporate ornate/ancient/exotic patterns cut into the surface of the stone (sort of like in the shared image); as though they were naturally occurring tattoos, but are like relief designs; very old perhaps even prehistoric looking. Take a look at these two images. Our Sentinel will have no facial features, outside of very general suggestions, because the gem is its face. I think this will add to the “scary unknown” theme of the creature? But these two pictures kinda give off the vibe I’m looking for: The one for perspective of sheer size, and the other image shows something similar to the sort of style I’m looking for. I think the image was a great reference to start with, especially given your description. So thanks for that! I like all of these, very cool! I like 03 the most, but 01 and 02 are a close second. Thing is, after looking at these I realized there would be nothing preventing us from saying all three of these are Class 5 sentinels (other than obviously having to choose one for the sake of the illustration). When we get to the box art though, perhaps there could be variations like this to the head and body etc of the surrounding sentinels like you have on all 3 of these.I’m good with this round; I think continuing with the tonals for these would be good.I like the idea for building scale into the sentinels themselves. Essentially the story goes like this: After Apsu “dies” these Sentinels start standing up one at a time out in the ocean and just stand there. Every period of x amount of days, weeks, or months, another one stands up. This continues for a very long time (centuries) as they slowly surround the entire landmass of Empyrnea. 1 by 1 they stand up out of the ocean portending certain doom. Since the <spoiler removed> the people of Empyrnea can only imagine what is going to happen when the Sentinels complete the circle around their land.Ok, so knowing that, one thing to think about for building scale into them could perhaps be related to the ocean. When they first stand up, they would be covered in seaweed and water would be pouring out of the rocks. However, the Sentinel standing next to him (and all the Sentinels next to that) have already been standing there for some time and would be totally dry. Having stood there for so long they may eventually have things like coral reefs or vines and stuff that appear really tiny on them. I like the idea of maybe having some trees grow on them – they stand there for so long that this could happen. We could also play around with maybe the idea of flocks of birds appearing merely as dots (not sure if that would help) or having it towering above clouds in the sky. These are just some ideas though.Another thought for this is that perhaps we are making the actual <spoiler removed>. If this is the case, the illustration could show him standing on land which would reveal the scale simply by him standing on top of a forest or mountains etc. Let me know your thoughts. Great work. Great! I think most all of those ideas are doable.The pouring water is a nice scale indicator but we can only show that (technically) if we’re depicting him in the act of standing up or having just stood recently.The coral can work too I think it’ll just have to be fairly small as you suggested.I think the seaweed is almost too minute to bother with it and have it look convincing. Although if it’s draped from his limbs and shown in negative space then it miiight work.The birds are very recognizable even as dots so that’s worth keeping in my book.clouds could help but I don’t want to obscure too much of the design. We could maybe save that attribute for the box art if we choose to go that direction. And as you mentioned, if this is in fact the one that killed apsu and made landfall then positioning him next to a mountain would read well immediately. Just depends on what your needs are. I’ll move forward with the tonals and try to impliment these ideas for each and then we can decide what works best. Stay tuned for EPISODE # 070 – Class 5 Sentinel Tonals which will be posted soon!